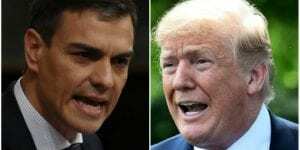 SPAIN’S new prime minister has rebuked Donald Trump’s threat to scale back US military support if European countries refuse to increase their military budgets. In a letter penned personally to Sanchez and other European leaders, Trump warned his NATO allies that they must increase their military spending to 2% of GDP if they want to continue to rely on US support. Spain currently spends 0.92% of its GDP on the military. The letter is believed to be Trump’s way of the setting the agenda for the upcoming NATO summit, due to take place in Brussels next week.